I have trouble getting my horse to pay attention to me sometimes in hand and under saddle. He often seems nervous and tense, always looking at things going on around him. I feel like he might just explode and it means I hate taking him out on hacks or to shows. What can I do? Horses don’t pay attention if you are not ‘leading’ them. If you don’t have a purpose or a plan in which to engage your horse, they are likely going to be focused on any potential dangers around them. They will feel like a lone horse and we all know that a horse on its own is vulnerable and will be particularly nervous and tense. First you need to have a plan for worst case scenarios - indications of bucking, bolting or rearing. Obviously safety should be your first priority so make sure you are wearing a suitable riding hat and that your tack is in good, safe condition. 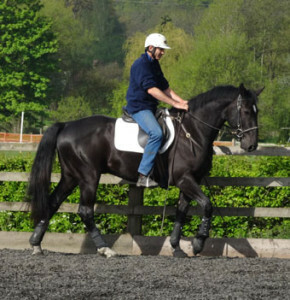 Keep control if you feel any bad behaviour coming on by disengaging your horse’s hind end to take away his ‘power.’ Do this by bending your horse’s head to the left or right until his hind end steps over. You can give at this point and repeat as many times as necessary until you feel your horse settle. If he is also tricky when led from the ground, practise yielding his hind quarters away from you to achieve the same effect (see my previous articles). Make sure to practise both these exercises at home so you have them in your toolbox should a difficult situation arise when out and about. Once you are confident with these exercises it is time to give your horse some challenges, starting with something simple. It could be something as easy as going around a couple of cones or markers until you feel good rhythm and an ease in their steering. What this does is give you and your horse a focus. Keep setting new challenges to avoid boredom for both you and your horse. Boredom will result in your horse testing you for something to do. Make sure he accepts that you are the leader and is happy to wait on your command. If you are at a show or on a hack you may have to think up some patterns without the help of any markers. Design some with plenty of turns in them to keep your horse busy and thinking, and his attention on you. Moving your horse’s feet is a sure way to get their respect and lots of changes in direction with good forward motion helps channel any nervous energy into a job. Moving feet is what a dominant horse does to get its counterparts to submit to their leadership. They use gestures backed up with a kick, a chase or a bite to get the other horse to move their feet and do their bidding (eg. ‘leave the food / mare / foal / me alone’). You have to adopt this attitude. Don’t try to be ‘pretty’ about it and don’t feel that just because you are at show that this ‘settling down’ time with your horse needs to be in a perfect outline with you on the perfect diagonal etc. It is about getting your horse listening to you. Once you have achieved this you can go ahead and work in an outline and show what you are both made of, but getting your horse to recognise you as the leader in this strange environment should be the first priority.